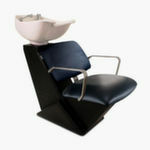 The Atlas Baltic Washpoint is supplied complete with tilting basin, mixer valve and handspray. The cabinet construction allows easy plumbing access. Available in Black as standard, all other colours from the REM fabric range are available at an additional cost. Please use the drop down box to select. Dimensions: Width 57cm, Height 116cm, Depth 97cm. A link unit is also available for any of the REM Baltic washpoint range.